We get lively about what exactly a neutral color is, and what exactly custom quilting is, and how to do it! 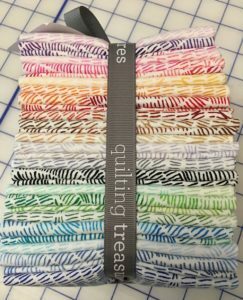 This episode is brought to you by QT Fabrics! The quilt hanging behind us is Pam’s quilt, “Great Grunge”. It’s custom quilted! The movie Fried Green Tomatoes. Pam has, in fact, eaten Fried Green Tomatoes at the Whistle Stop Cafe in Juliette, GA.
Martha Pullen is the name we couldn’t remember in the show! Love your shows. Think we need more! In cleaning out my UFO”S I discovered one I am stumped as to what to do with it! What do you do with quilt block you have made when you were a newbie? I began quilting 3 years ago, and about a year into it, I decided to make a cute quilt I saw on the internet. I followed the author’s instructions, and it was the wonkiest thing I have ever seen. I have 25 18″ blocks, and they are all terrible!!! What would you do with them? Should I rip them out and reuse the fabric? Should I cut them up and make a “disappearing block” What would ya’ll do? Topics: Quilts for men. Pam’s spreadsheet for prioritizing projects. Learn and laugh with Stitch TV Show!! I’d love an episode on “snowball” AKA flippy corner blocks and a discussion of which techniques work best for each of you. I am a pretty adventurous quilter; paper piecing, curved seams, and y-seams are all in my repertoire and I am pretty happy with the results but this method makes me crazy! I have tried a number of piecing techniques (special rulers, the mark, stitch, flip, iron, then trim method, etc.) but still find it challenging to achieve accuracy when joining snowball blocks. The seams just don’t consistently match up very easily. Currently, I am making an X’s and O’s quilt for my niece and have had a bit more success using the Folded Corner Clipper tool by Prairie Sky Quilting and starching the heck out of the blocks before squaring them up; however, I would still like to achieve greater accuracy. So, Lynn and Pam, what works for you? Yes. I’m with Sheila. Would love to see some ideas for boys’ quilts. Seems I only make feminine stuff. Love your shows. More please. How do you choose which project comes next? I love your shows. Keep up the great work. I love making quilts , I have made everyone in my family one , or 2 haha.. Would love to try and sell a few , ( unemployed ) what would you suggest? Do you , either of you sell your quilts? Love the show you both make me laugh!! Thanks for another great show. Very informative. I do a large amount of applique mixed with blocks, so I like the quilting to be a little subdued so that the applique is the star of the quilt! Thanks for the chance at winning the fabric. Oooooh, I like the idea Judi Rutherford had about book reviews! That would be amazing!! Include books for precuts please 🙂 also was hoping to hear some talk about hand stitching. Different types, project opportunities, etc. I really enjoyed your talk about epp and have been curious to learn about other tv friendly types of stitching. Thanks! fabric and color trends.. but love the show and all the topics thus far. I love the show and the fabric. Always looking forward to the official show and the Virtual Stitch Ins. You gals are the best. I enjoy watching you guys. I am relatively new to quilting and love the tips and thoughts. My choice for sewing room company! I am new to quilting. Id like to know how you both approach entering a quilt in a show. What tips can you give new quilters entering for the first time. You two are always entertaining and informative, a joy to watch! I would like to see more close-ups of your quilts! Your show is funny! Agreedwith above re a book review, also perhaps making own quilt designs for tops, the quilting designs for both longarm and domestic, oh and the increase in fussy cutting, its everwhere! Challenge vs Mystery Quilts. Which do you prefer, or are both equally creative for you? I enjoy both. Have a great day! I love Pam’s quilt “Great Grunge”. I always enjoy listening to the two for you while sewing. Love the show. Have you all done weighted blankets? Great Show. Would love to see more close=ups of the featured quilts. Thanks for the fabric giveaway. Love your theme music! You two ladies amaze me with your banter and comraderie and friendship. I enjoy watching your shows and try not to miss them I live in the UK and if I cant watch you live, I play catchup. I would love to hear on a show topic about maybe more about art quilts, different types etc. I recently became interested in the technique of confetti quilts, have either of you tried that yet? Have a great weekend and look forward to your next show. Love your show. Do you mean Martha Pullen? Fancy sewist. I just love your show! I have a question. Lots of old quilts have lasted for years and years. They are made of simple materials like cotton fabric, batting and thread. But today we use other materials like fusable interfacing. Not that I make heirloom quality quilts, but I wonder how the glue on fusable interfacing will stand the test of time. Will it decay in 50 years? Will it just flake off, or decompose into an oily mess, or something else. Do the manufactures try to test for this? I posted a comment the other day, but it seems to have disappeared. I was wondering what you guys do with UFO’s that you started some time ago and then pulled out and thought “What am I going to do with this” as your skills are now better then at the time you made them. Do you rip them apart, and redo them? Do you just go ahead and make the quilt anyway? Or do you do something new with them? I think a virtual trunk show from both of you would be fun. How to quilt antique quilt tops! As I progressed with my quilting abilities I have ventured more into custom quilting than just an all over free motion. Now I have to remind myself that sometimes an all-over design works and go for it. i wish your show was on more often, also i love your virtual sew ins. i would like to watch what you are sewing. i am patiently waiting to see the nail polished dipped vase you made. I know you might not want to name a brand of sewing machine but can you discuss those things about your domestic machines that are most important to you when you piece? I am looking for a new machine and quite perplexed. I am always interested in new patterns. I am with a couple of the gals above. I would like to see guy quilts. I know about t-shirt quilts. Can you do the same with Polo shirts? I don’t have any ideas for your show. I like everything you present. It’s all good to me as I am a beginner quilter. I have heard a lot about batting that is ironed on in making the quilt sandwich. I would like to know more about this option and how it works including the pros & cons, such as making your needle sticky? Thank you, great show! I’d love to hear about what inspires you and how to get out of the “slump” one may get into with sewing. It’s all good! I wouldn’t mind another show where you take people’s tops and discuss how to quilt them. I am catching up with older episodes and I have really enjoyed “How Do I Quilt This?” I would like to see more episodes. I would like to know if you ever use photos to make quilts from and what tools or apps you use to do that.